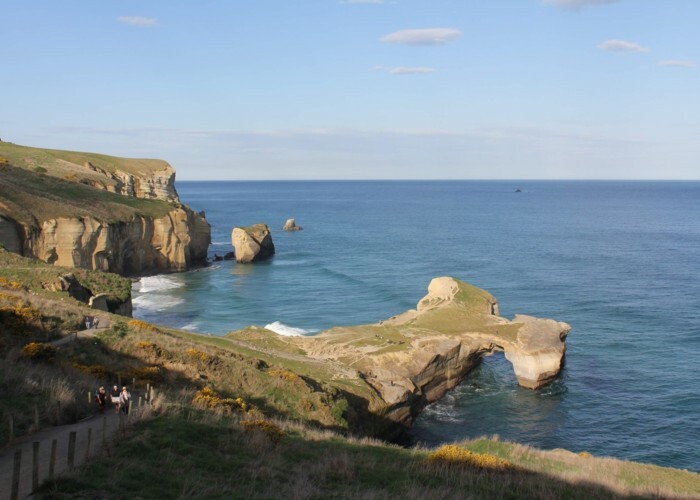 A popular coastal walk in Dunedin that explores coastal cliffs and a hand-dug tunnel. Tunnel Beach • By Matthew. Licence: C.
This track drops steeply to a coastline of dramatic sandstone cliffs and a small headland of eroded archways. It is a popular walk, with a steady stream of tourists sweating their way back up to the car park. 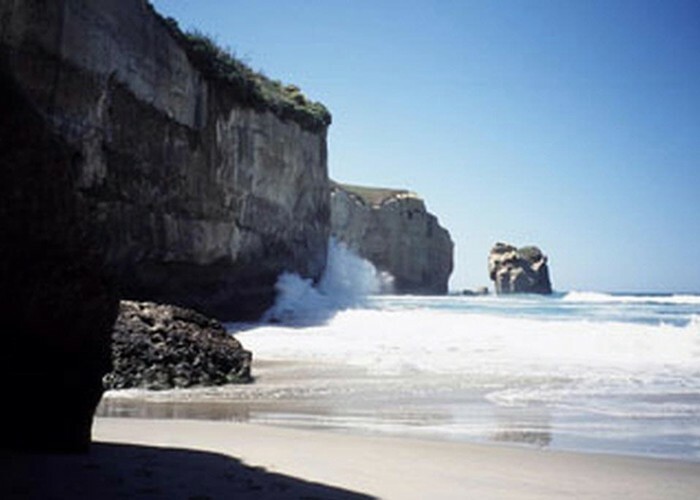 Tunnel Beach from secluded cove • By ledge. Over a stile, the shingle track drops directly downhill across farmland. It bends down toward the cliff edge and a small but striking headland. Tucked into the sandstone, a dark tunnel leads downward on concrete stairs, opening out of the cliff at a secluded beach. The tunnel was commissioned by John Cargill, who lived nearby. The story that one of his daughters drowned at this beach is an urban myth. There are a number of unfenced cliff edges on this track, and a pounding ocean that is unsafe for swimming. Added 1 June 2001 by MatthewMatthew. 1 revision 7 November 2018 by MatthewMatthew. 68 views in the past year (6 per month).